As holder of the university's Kamil and Talat Hasan Endowed Chair in Classical Indian Music, he is responsible for building interest in Hindustani music through a variety of programs -- functioning as a combination of academic instructor, concert promoter, event coordinator, sitar teacher, fundraiser, and program manager. "We are delighted that Dard Neuman has joined us in our efforts to further the study and performance of the Indian arts at UC Santa Cruz," said Chancellor Denice D. Denton. "As our first endowed chair in Indian classical music, his appointment is a critical component of our long-range plans to create a flourishing center of South Asia studies on campus." Neuman noted that the UCSC endowed chair in Indian music may be the first of its kind for an American university. "To have a chaired position that was created solely for Hindustani music is unique in the United States," said Neuman. "I believe that UC Santa Cruz had the very first one. The 33-year-old Neuman comes from a long musical lineage. His father is also a musician and ethnomusicologist who has studied the anthropology of Indian music. His mother was born in India to a family of music lovers, and his aunt is a professional sitarist. Neuman was presented with a small sitar on his fifth birthday in India, and he soon began studying with his aunt. "I come from a background where music saturated the air," Neuman observed. "I had constant exposure to visiting artists. My grandparents were close to musicians who often played at our house when they came through town. And when my father was at Dartmouth and at the University of Washington, he would invite visiting artists and they would often stay at our place. So I couldn't help becoming obsessed with the music--either you rebel and have nothing to do with it, or it becomes part of your blood, your passion." 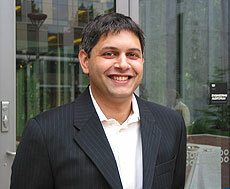 Neuman has many ideas to help build the Indian music program at UCSC over the next decade. In an effort to expose students and the community to a wider range of traditional music styles, instruments, and vocal techniques, he plans to create a revolving visiting artist course to bring different musicians from India to teach at UCSC. He will also continue UCSC's Indian concert series and hopes to present an Indian music festival--modeled after the two- or three-day festivals in India that run all day and all night long. "In Hindustani music, there are ragas for different times of the day," Neuman noted. "And since most concerts take place in the evening we seldom hear the late or early morning ragas." In addition to bringing in scholars from around the world for academic conferences, Neuman also hopes to establish an archive of Indian music at UCSC. "There is a substantial collection of concert recordings dating from the 1950s and commercial recordings dating from the turn of the century," said Neuman. "An archive at UCSC would allow people to listen to a wide selection of archived music, interviews, and field recordings." Neuman added he would like to create a CD series where both musicians and ethnomusicologists can reflect on what's happening in selected musical recordings. He additionally envisions creating videos of renowned musicians reacting to old recordings and talking about them as a way for students to have historical material come alive. And topping his wish list, as UCSC expands its programs, is to eventually produce an equivalent for Indian music of the Ken Burns documentary on jazz. "It's quite exciting," said Neuman, as he described plans for the beginning sitar course he is teaching this fall quarter. "My ultimate goal is for UC Santa Cruz to become a center for Indian scholastic and performance activity in the U.S."